Tired of bash? Prefer zsh, ksh, tcsh, fish, or sh? You can quickly change the default shell in Terminal app, in addition to changing a users default login shell for when logging in remotely with SSH or otherwise. Here’s how to do both. 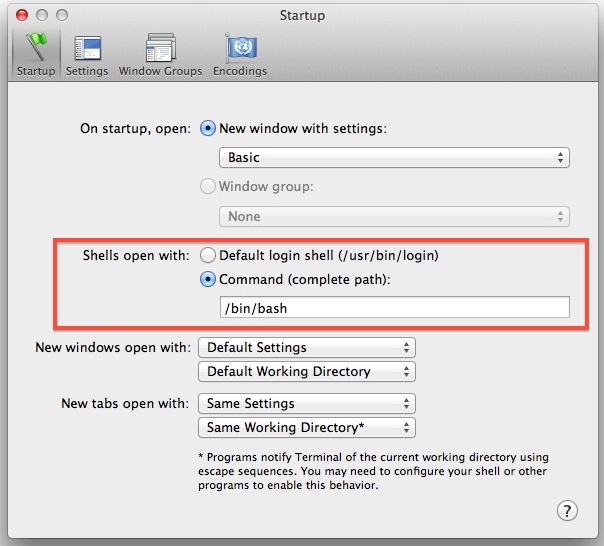 This adjusts the new shell that is used upon Terminal app launch, new terminal windows, and new terminal tabs, becoming the new default Mac shell. Placing any of those in the ‘Command (complete path)’ box will set the new shell as the terminal window default. You can also change the default shell through the command line itself using the chsh command, which is shorthand for ‘change shell’. This will be necessary if you want the default shell to be different when logging in with SSH or telnet. You’ll need to authenticate each change as well, the command will ask directly or you can prefix it with sudo. Here’s how to set the default user shell to zsh, bash, tcsh, ksh, sh, or any other shell for that matter. We covered the first part of this years ago and it hasn’t changed since, even with OS X Lion and OS X Mountain Lion, and Mavericks. With MacPorts installed you also able to install newer versions of the Bash (e.g. 4.2.20) and start it by default. It’s really a difference in scripting and some shells offer different binaries than others. Bash is the most common, there is little reason not to use it. Point for chiggsy for mentioning zsh. FWIW, /bin/zsh exists on my stock Lion install (I suspect it’s there on any stock Lion install). You may also need to edit /etc/shells to allow changing to an unusual shell (such as /usr/local/bin/bash).